When Samford Physics Department chair Alan Hargrave says “you’re going to build a rocket,” it’s safe to assume he means that literally. But when Hargrave spoke those words in July to a lab full of students he might just as well have been expressing the hopes of everyone involved in Samford’s new Minority Youth Science Academy (MSYA). The high school students doing the building aspire to careers in science, technology, engineering and mathematics (STEM) fields. The rocket kits on the tables in front of them were nothing compared to those they’re building for themselves with parts gathered from teachers, family, faith and their own resolve. MYSA, held July 6-9, arose from conversations between Howard College dean David Chapman, biology professor Drew Hattaway and chemistry professor Denise Gregory, who also serves as Samford’s Director of Diversity. The separate questions they considered—how to emphasize the college’s STEM programs, how to attract new students and how to increase diversity at Samford—converged in a single idea for a new summer program to accompany established Howard College camps, including M.D. Calling, J.D. Calling and the Summer Debate Institute. 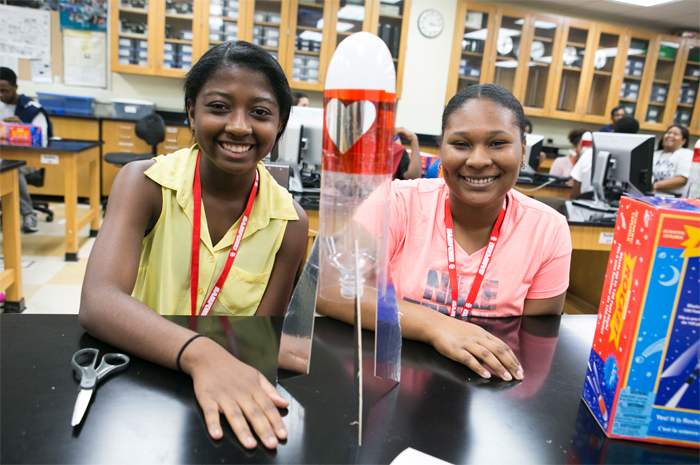 Gregory and Hattaway designed MYSA to give outstanding minority high school students a taste of college STEM work, help them navigate the world of college admission and scholarships and learn from minority STEM professionals. The program also addresses the decline of STEM graduates nationally and the historical underrepresentation of minorities in STEM fields. The response was overwhelming, especially for a first offering. Twenty-one rising 10th-12th grade students enrolled in MYSA. Gregory said the program will return in 2015 because the results were so positive. “All it took to help these young minds pick a path was exposure to the possibilities, and they ran with it, ” Gregory said. During the program, students took part in experiments in chemistry, biology and physics and learned about college application and preparation. A Q&A session with a panel of minority STEM professionals was especially helpful to the MYSA students. The session included Dr. Kenny Jno-Finn alumnus `04 (Eskridge and White Physiotherapy,) Ms. Ashley Spann `11 (graduate student at UAB Medical School) Dr. Mercedes M. Morlaes-Aleman (Research Associate for UAB Division of Preventive Medicine,) Ms. Amanda Plain (graduate student in Chemistry at UAB and adjunct professor at Miles College,) Mr. Michael Martin (graduate student at Samford’s McWhorter School of Pharmacy,) and Dr. Brian Sims (assistant professor of Pediatrics at UAB School of Medicine). “The panel really got to me,” said Antrenique Jones of Jonesboro Ga. Jones is interested in environmental science but was uncertain how to refine her interests or prepare academically. “I was kind of getting discouraged,” she said, echoing the self-doubt other students also mentioned. Jones said the STEM professionals who served on the panel helped her refine her interests and reminded her that she can do anything. Michael Elridge of Trussville, Ala. also found direction at MYSA.“I like all science, so how do I pick one?,” he wondered before attending the program. By MYSA’s end, he said that he had turned toward some fields and away from others. Former Samford SGA president Cameron Thomas `14 spoke to the MYSA students about his experience as a minority student and young professional. He said he still isn’t quite sure how he came to Samford from Goodwater, Ala., when there were so many things that could have prevented that. He noted the help of family, friends, faculty and faith, but also credited his determination to meet the intellectual and cultural challenges Samford offered. A limited number of MYSA scholarships were available, and some individual donors sponsored students who would not otherwise have been able to take part in the program. Anyone interested in sponsoring students for MYSA 2015 should contact Denise Gregory at djgregor@samford.edu. The Howard College of Arts & Sciences Annual and Endowed Diversity Scholarship, created this year, will award scholarships from the first $1,500 of gifts received annually. Gifts received above the $1,500 will remain in the fund to apply towards the $25,000 required amount to establish the corpus of the endowed scholarship fund. To support the fund, contact Samford Advancement Officer Stacy Gay at sgay@samford.edu.